Edible arrangements are quite popular these days. A quick perusal of the internets tells me that they can also be expensive, which is why I am loving these DIY ideas. C'mon - admit it... you've tasted your Crayolas. And they taste like...well, the way they smell. Not so with these edible crayons from fashion and food site Luxaire. The colors are just as bold, but the medium itself is totally edible. Skip the pine and flowers this holiday season and go edible with this charming berry tree. 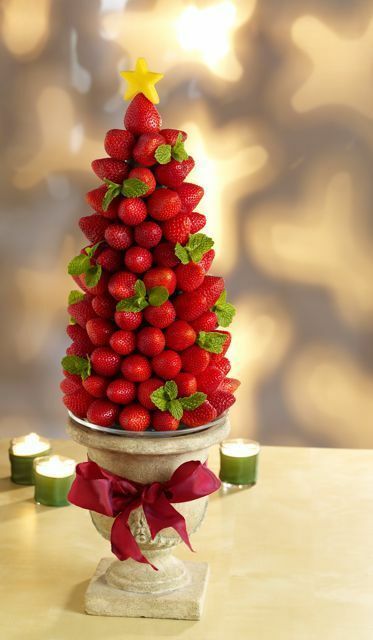 Decorative and practical, the strawberry tree is topped with an edible star as well! It's creator, cookie and dessert aficionado Tish Boyle, graciously shares with us a tutorial of how to put one together. This one goes into the why?-because-you-can file : Toasty pâte brisée serving utensils and ramekin. Bread bowls? Ha! Speak French? Then tell us all what this says, cause I'm sure it sounds savory: "oilà il est à présent temps de voter pour le projet qui vous semble le plus pertinent. Attention, fin des votes le lundi 9 novembre à 12h. Un grand merci à Nathalie pour avoir joué le jeu et pour sa proposition qui donne carrément envie de lécher l’écran !"